Rachel Chong, born and raised in Sabah, Malaysia. Malaysia is located at the heart of Southeast Asia. Malaysia is combined by two different parts, the West Malaysia and East Malaysia. 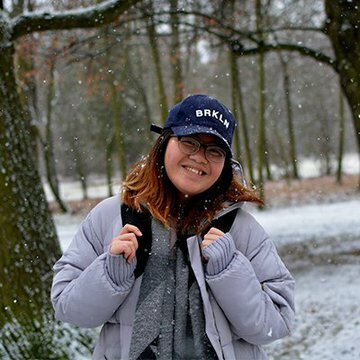 Rachel lives in the capital of East Malaysia which was mentioned Sabah.Rachel is currently pursuing her third year in Bachelor Degree of Commercial Design at Chienkuo Technology University. She is inspired by a lot of graphic designers and artists to pursue her dream in the field of design. She picked up Adobe Photoshop, Adobe Illustrator, Adobe Premiere Pro during her elementary school. She is also an outgoing person because she believes that all work and no play makes Jack a dull boy.Outside of studying, Rachel picked up photography because she believes that photographs are the only thing that can freeze the swinging of a pendulum. Travelling soon came in as well as she starts her journey in Taiwan and was given the opportunity to stay for one semester in Czech Republic from the September of 2016 to January of 2017.Rachel claimed herself as the luckiest girl in the world for having such supportive family and friends. Although struggles and setbacks pulled her down on the way, but with strong will and determination she believe everything is possible. This talk is sponsored by Mr Lin. He wants to encourage people to work hard and dream big. Production assisted by IOH Helper Jenny Hsueh. Edited by Lily Lin. Rachel Chong is Malaysian Chinese. Her family follows Chinese tradition, but believes in Christian ritual and moral. In the age of 16, Rachel self-learned Adobe Photoshop, Adobe Illustrator, and Adobe Premiere Pro and began to be interested in the field of design. Rachel’s motto is “If you want something different, you should stop following the mainstream and go for it.” Those are the reason why she decided to study in Taiwan for pursing her dream of being a graphic designer. Chienkuo Technology University (CTU) is located in Changhua County. Environment of the campus is quite relaxing and beautiful. CTU is famous for its practical teaching method. This encourages students to apply theory for solving problems in real life. In addition, CTU provides many exchange programs, covering Asia, Europe and America. Those programs require participants to pass certain level of English exam and fill some forms. Students can go to the CTU’s International Office for detailed information. Rachel is currently studying in the department of Commercial Design (CM). It’s a 4-year degree. Rachel describes “Commercial Design” as any graphic we see in the life. The courses include Photography, Branding, Packaging, Printing, 3D, Video Editing, Photo Editing, Web Designing, etc. Because CM’s workload is usually heavy between midterm and finals, Rachel suggests that junior should set priority for projects and make the best out of the time. Rachel is impressed by Taiwaneses’ hospitality. She loves Taiwanese Food, and recommends everyone to go to night market for discovering local cuisines. 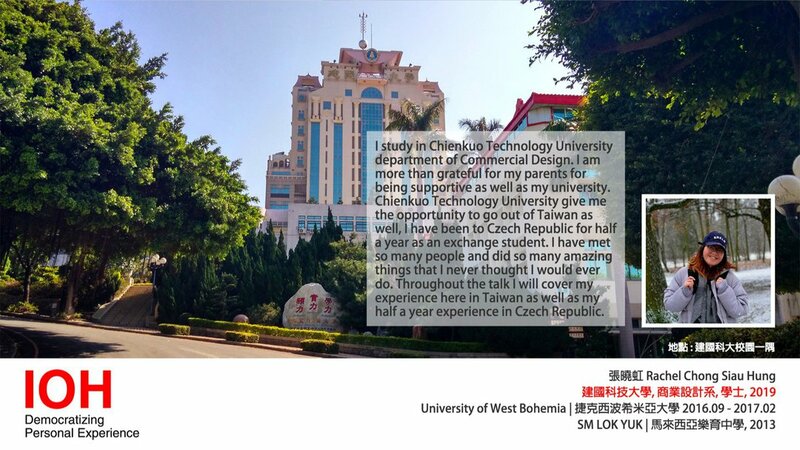 In her last semester, she went to University of West Bohemia in Czech Republic as an exchange student. Rachel hang out with peers from different countries, such as France, Netherlands, and Hungary. From those friends’ sharing, she not only broaden her horizon, but also learned how to embrace different perspectives. After 3 years of living in Taiwan, Rachel learned how to arrange life stuffs by herself and take responsibility for her own decisions. She advised the freshmen to be flexible to adapt to the new environment and make friends with different people actively. Although you might feel homesick from time to time, just pull it through. All the efforts would end up being worthy memories.